My card base is a standard A2 size. Next I die cut the feathers and colored them with three different Copic markers. Once that was dry, they were heat embossed in white. Each feather is adorned with a button and some twine. They are attached with glue dots on top of the feather and then another glue dot directly behind the button to attach it to the card base. The sentiment has been die cut five times and stacked to add a little more dimension and done! Was so happy to have you as our GD This month 🙂 ADORE this card!! Great use of the sketch! Hi LeeAnne! Your card really takes the sketch to a whole new level! Those feathers are gorgeous! so glad you're joining us at JUGS for the month. This is beautiful! I love that feather stamp set. What a wonderful way to make it work for this sketch…..amazing! So happy to have you with us this month at Just Us Girls! Those die cut feathers almost look real, Lee-Anne. They're beautiful with the embossing. Super card! 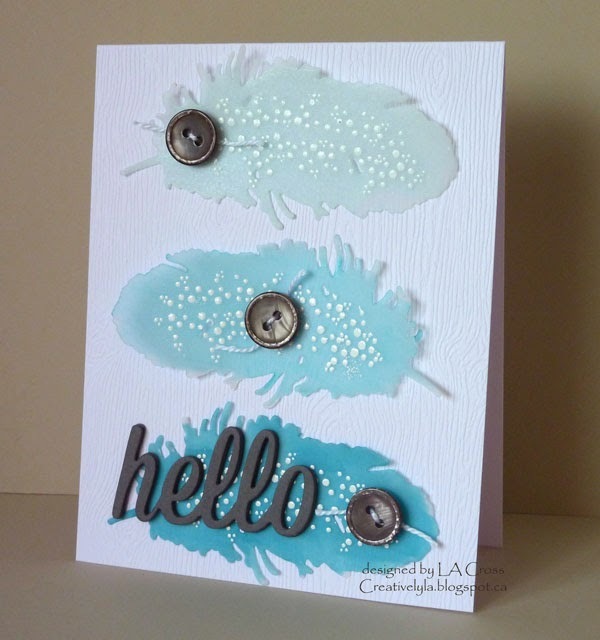 Good Morning Lee-Anne…so glad your our Guest Designer this month over at JUGS! You sure started off strong with this amazing card…what am I saying…all your work is amazing! Looking forward to seeing what else you do! Your card is gorgeous Lee Anne! We are so lucky to have you as our April guest at JUGs! I don't have words! This is simply stunning! I just had to leave you a comment on this card. It is so amazing and incredible. Great job on the challenge. Lee Anne, your card is stunning! At first glance I thought those were real feathers. I love the white embossing on them. We are so lucky to have you as our guest designer this month at JUGS! OH MY GOSH, this is awesome! LOVE what you did with the sketch! Fabulous Job! Those feathers with the whit ep is so inspiring! Love it!! Congrats on the guest dt spot!